A well trained retriever can make a good shooting day into a day to be remembered. That special retrieve you have shot can make memorable moments, touched with pride and the admiration of fellow gunners. Training your own retreiver is extremely rewarding and with a little 'know how', well within the capabilities of most people. 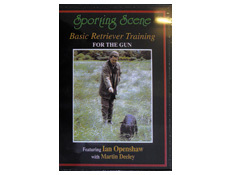 In this DVD, Ian Openshaw and Martin Deeley provide you with the 'know how', clearly and in easy stages, to train your dog for the gun. Ian Openshaw is a top professional retriever trainier and handler, having made up numerous Field trail Champions. Ian is joined by Martin Deeley who is a leading gundog commentator anmd author.